This is the next step of spiritual practice after one begins to chant the Name of God but it does not mean that we stop chanting. It has to be done along with chanting of the Name of God. It always helps to be with like-minded people on a regular basis. 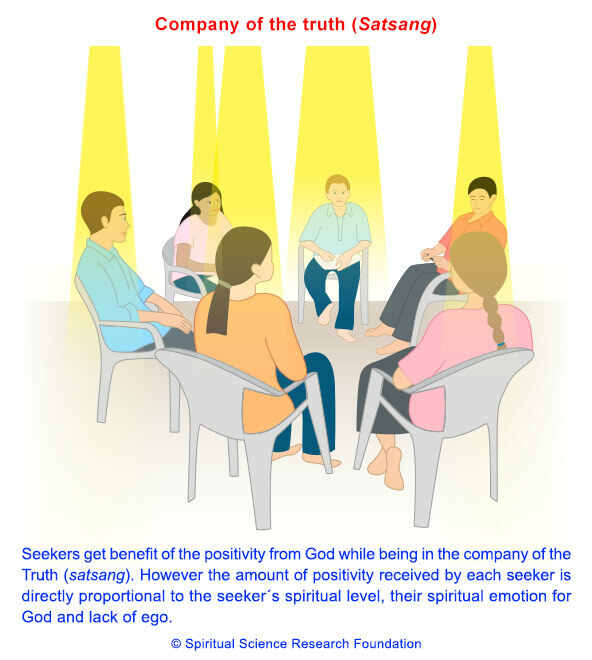 There are many benefits to be gained by attending a satsang and understanding what is the meaning of satsang. One is able to ask questions about the science of spirituality and therefore clear any doubts that one might have. If we have any doubts about spiritual practice or about the principles we need to get them cleared or else we will not be able to practice spirituality wholeheartedly. One gets to share one’s spiritual experiences and also to understand the spiritual significance behind them. This gives us the motivation to persevere on this path as we get inspired by someone else’s faith. At a subtle level, one gets the benefit of Divine consciousness (Chaitanya). The added sāttviktā of the satsang helps to facilitate one’s spiritual practice. Due to spiritual pollution in the form of rājasik and tāmasik elements around us, it becomes difficult to even think about God and spiritual practice. However, when we are with a group of people who have been chanting the Name of God all day, the opposite flow happens! We get the benefit of the sāttvik rays or the Divine consciousness that emanates from them. We may enter the satsang badly beaten up by life’s ups and downs during the past week, however we are revived from within and feel as good as new by the end of the satsang. The following picture is a representation of what actually happens during satsang. Now that you have learned about the meaning of satsang, we recommend that you study our other articles in this series: Benefits of satsang, Types of satsang and Satsang with Saints.